← Recover, restore, revitalize, repeat. 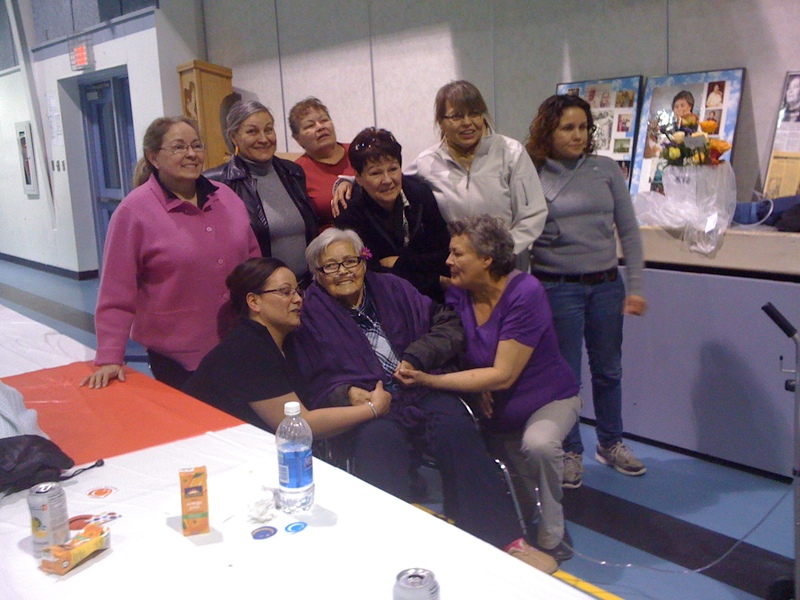 I just got back from another visit to Muskeg Lake, where I joined the family celebrating Freda’s 79th birthday, which she attended in a wheelchair, with oxygen tanks, and only lightly medicated for pain. We didn’t think she’d see the end of September, and last Thursday even the birthday party looked like a poor bet. But she seems to draw as much strength as she gives in love at these events, as anyone could see from her smile as she was wheeled for photos into the centre of the 100-or-so direct descendants who gathered in the band hall for the celebration. For her birthday she was presented with a newly published copy of Arok Wolvengrey’s PhD dissertation on Plains Cree syntax, a prototype volume of Plains Cree texts of her uncle William Greyeyes (which I hand-delivered on behalf of H.C. Wolfart), and a draft children’s picture book (from me) about visiting câpan (great grandmother). The day after the party, one of her daughters (between hands of Canasta) sat and helped me add in text in Cree, and a son gave me the name of the log cabin’s builder, so I can hunt for photos of the construction. This entry was posted in Community News and tagged Freda Ahenakew. Bookmark the permalink.